MOSCOW, March 14. /TASS/. Moscow is not linked to the incident with former Russian spy Sergey Skripal who was poisoned with a nerve agent in the United Kingdom, Kremlin Spokesman Dmitry Peskov told reporters on Wednesday. "Moscow’s stance is well-known, London was told about Moscow’s position through diplomatic channels: Moscow has no connection to the incident that took place in the United Kingdom," Peskov said. "Moscow won’t accept absolutely unfounded accusations against it, which are not substantiated by any evidence, and won’t accept the language of ultimatum," Peskov stressed. Meanwhile, Russia is "open for cooperation in investigating" the incident, but unfortunately, the British are not showing this readiness, the Kremlin spokesman stressed. "Stay sober, do not succumb to emotions and lies," Peskov told reporters. Asked by the media if Moscow feared the risk of international isolation over the Skripal affair, Peskov said, "We hope that common sense will prevail and that other countries will at least stop to think if there is any proof or there is none, and if reproaches against Moscow have grounds to rely on." Asked why his statements about Russia’s non-involvement in the Skripal incident were to be believed, especially in the wake of other accusations addressed to Russia from other countries, Peskov recalled that "we have not seen any confirmation of hacker attacks, fictitious hacker attacks by Russia, to this day." "As far as Crimea is concerned, there was no annexation neither de facto nor de jure. There were legitimate decisions taken by the Crimean parliament and confirmed in a referendum, so any such charges - both their essence and form - are wrong. "Common sense prompts and demonstrates that no grounds for charges [in connection with the Skripal case] can exist," Peskov stressed. "Russia has nothing to do with the incident whatsoever," he reiterated. Peskov refused to discuss any versions of the incident. "That’s none of our business - to voice any versions of what happened. The Kremlin does not investigate crimes or incidents, let alone those that took place in the territory of another country," he explained. "As you understand, any illegal actions against any Russian media outlet in the United Kingdom will lead to retaliatory steps," he said. "What kind of steps will be taken? Those that would serve Russia’s interests in the best way," Peskov added. 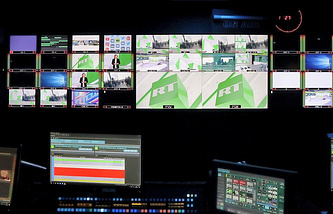 British media watchdog Ofcom said earlier that Russia’s RT TV channel may be stripped of its broadcasting license in case British investigating authorities came to the conclusion that Russia was involved in the poisoning of former intelligence officer Sergei Skripal and his daughter. RT, in turn, said that it opposed the position taken by Ofcom, saying that "by linking RT to unrelated matters, Ofcom is conflating its role as a broadcasting regulator with matters of state. "As for British media outlets, they showed their ‘quality’ in this story as well. They hardly deserve any attention here as a reliable source of information," the Kremlin spokesman told reporters. He said as much in response to a request to comment on recent reports by British media outlets. They asserted that London could apply a provision of the NATO member-countries, which states that an attack against one alliance’s member is regarded as an attack against all allies. However, he refrained from answering a question on whether Moscow is ready to respond. Former Russian military intelligence (GRU) Colonel Sergey Skripal, 66, and his 33-year-old daughter Yulia on March 4 suffered from the effects of a nerve agent. They were found unconscious on a shopping mall bench in Salisbury, southern England. Both are now in hospital in critical condition. In 2004, Russia’s Federal Security Service (FSB) arrested Skripal and later on, he was sentenced to 13 years in prison for high treason. Six years later, the former colonel was handed over to the US as part of a swap deal involving espionage suspects. Later that same year, Skripal settled down in Britain. On Monday, UK Prime Minister Theresa May said Russia was "highly likely" responsible for Skripal’s poisoning, calling it a "reckless, indiscriminate and irresponsible" act against the United Kingdom. She claimed that the nerve gas, known as Novichok, had been developed in the Soviet Union. May warned that if Moscow’s explanations did not satisfy London, new sanctions against Russia would be discussed on Wednesday at the meeting of the UK's National Security Council. On Tuesday, Russian Foreign Minister Sergey Lavrov said Moscow had no connection to this case. He also said Russia had not received any request from the United Kingdom on the substance allegedly used in the Salisbury incident. Under the Chemical Weapons Convention, the UK must have contacted with Russia granting it access to the substance. In line with the document, the suspected party has 10 days to respond to the request.